The Cheese and Wine Shop sells a great range of Chocolates. From Bars, Novelties, Boxes and leading brands such as Bendicks, Lindt, Gudrun, Duc D`uo, Hachez, and Cafe Tasse. Also, our local heros, Brownes and James, along with our own label selection produced especially for us. See our key brands here. Great range of No Added Sugar Chocolates also available. Read all about Chocolate, and its history here. 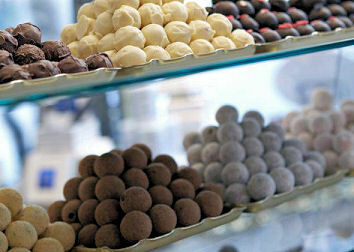 Choose your favorites, packed in bespoke ballotins. From Classics like Champagne in Charbonnels finest Dark or Milk Chocolate, to more contempoary flavours such as Sea Salt, or Appletons Jamacan Rum. Or why not choose a mixed box? The Cheese and Wine Shop has a superb range of Choclolates suitable for Children of all ages! Choose from our delicious chocolate novelties, which are a great treat for kids of all ages. Select from the finest Belgian, Swiss and Dutch chocolatiers, alongside our local heroes from Beeches, James and The House of Dorchestor! See our selection of chocolate Animals and noveltys here! Choose your favorite Chocolates by type; choose from Dark (Bitter) Milk, White or mixed. See our selection of Chocolate cups here; they are ideal for filling with Mousses, Fruits and Fruit Salads, and of course Ice Cream and Sorbets. Luscious Chocolate coated Fruit, Nuts, Mendiants, Florentines are all here. See our selecion here. Hand made Chocolate Angels, Chocloate figures and Noveltys from Belgium, and closer to home!. Succulent Fruits and Nuts dipped in finest Belgian Chocolate, along with After Dinner treats! 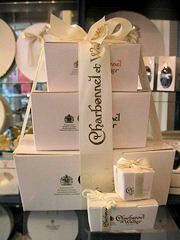 Liqueur Chocolates are popular at The Cheese and Wine Shop throughout the year, so they aren't just for Christmas! From Belgiums finest producers, Abtey, Gudrun and Duc d`O, along with Anthon Berg from Denmark, Asbach and Mon Cheri, we have a great selection available for next day delivery.